Originally intended to present the driving profession at fairs and other public events, the simulator is now used for training and education of all driving personnel including the teaching of specific knowledge about local infrastructure and route conditions. For use in driving school currently further functions of the simulator are planned. DVB and INAVET continue their successful cooperation in the implementation of a second, more mobile simulator. It is designed in a handy modular design and thus even more flexible in the location of use. Nevertheless, the structural similarity and functional authenticity will be maintained with a real tram, as in the first driving simulator. 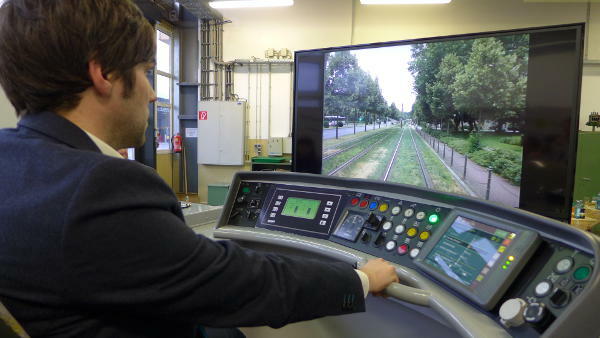 The technology developed for this purpose also forms the basis for requests from other transport companies for the development and use of tram simulators for driver training and further education. At fairs like ‘Karriere-Start 2017’ the popularity of the tram simulator is hard to neglect. Enthusiasts stand in line for hours to finally drive around the whole city center of Dresden with the help of our realistc sound and HD- video recordings. To integrate the tram simulator even better into the education process, it was moved to the DVB headquarter and therefore in the newly designed training room. With the event “DVB-Fahrschulwagen ohne Räder” (engl. 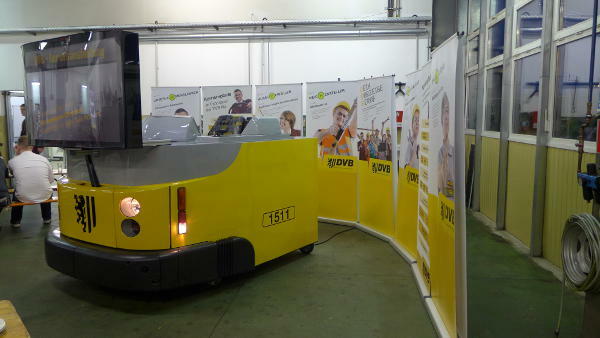 driving school vehicle without wheels) at the end of august 1017, the tram simulator was presented at its new site. "DVB erweitert Ausbildung für neue Fahrer"
The driving simulator, which is already celebrated as major attraction at fairs and exhibitions, was honoured with the "Human Resources Excellence Award" on the 2nd of December 2015. This is a very important prize for innovative projects in human resources management. Together with the DVB, INAVET is very pleased about this shared success. "Straßenbahn-Simulator der Dresdner Verkehrsbetriebe gewinnt Human Resources Excellence Award 2015"
"Straßenbahn-Simulator der Dresdner Verkehrsbetriebe ausgezeichnet"
"Human Resources Excellence Award 2015 für Straßenbahn-Simulator der Dresdner Verkehrsbetriebe"
"DVB gewinnen Human Recources Excellence Award 2015"
The Dresdener Verkehrsbetriebe AG (DVB) as the municipal transport company of the city of Dresden in Germany, developed a driving simulator for its own training centres. The tram driver’s cab includes an originally duplicated head of a tram,which was built by the apprentices themselves. The few prefabricated tools are all originals, that you can find in real DVB trams, too. INAVET was responsible for the integration of the original operating desk, that simulates a real driving environment. Furthermore, real driving dynamic was realized and the door control simulated. Caused by the original operation processes, the simulator can be used for the personnel education and training. Another requirement was to base the simulation on video material about real routes. The efforts of INAVET were very successful: After only some seconds, the testing drivers think themselves in a real traffic situation. Our integrated audio output as well as the dynamical adaption from original recordings supported this experience and gave the testers the best possible driving authenticity.